Home » Is That Boulder in Your Driveway From Outer Space? Is That Boulder in Your Driveway From Outer Space? I am a meteorite researcher and a cosmic killjoy. Although I spend most of my time analyzing extraterrestrial rocks to learn about the geological history of asteroids and the origin of the solar system, my part-time job is to dash the hopes of hundreds of people. Nearly every day, members of the public contact me, confident they’ve found a meteorite. More than a few have compared the 40-pound granite boulder in their driveway to the most expensive meteorite on eBay, converted pounds to grams, multiplied that number by $1,000, and started checking real estate prices in Aspen. These folks are convinced that the dark rocks they’ve stumbled across while walking the dog are dead ringers for spectacularly expensive meteorites from Mars. Real meteorites are hard to find. I’ve never found one. They are vastly outnumbered by rocks that originate on Earth. But many people think they’ve beaten the odds and contact me. Some are hoping to strike it rich; others want to contribute to the scientific enterprise. But one key reason some folks are interested in meteorites is because they forge our cosmic connection. They remind us that we don’t live in isolation; chunks of celestial bodies continually pelt the Earth. If it weren’t for the impact 66 million years ago of a 6-mile-diameter asteroid, the dinosaurs would probably still be around. And if these ancient behemoths still roamed the Earth, there wouldn’t be any cows, cats, pigs, or people. Meteorites remind us of our contingent existence. My most poignant meteorwrong story started with an e-mail from a fellow from the East Coast who told me of his financial woes. The bank had foreclosed on his house, the IRS had seized his assets, and he ended up sleeping on a friend’s couch. Eventually, he grew despondent and decided to commit suicide. One night he got drunk, jumped into the Atlantic Ocean, and swam out to sea. When the sun came out the next morning, he was still afloat and headed toward shore. As he pulled himself out of the water, he discovered an outcrop of dark rocks before him. He was sure God had seen his plight and directed him toward valuable meteorites. But when I received his samples a few days later, the dark rocks turned out to be terrestrial basalts. After I told him about my findings, I worried about his wellbeing—until I received an e-mail from him a year later asking about another meteorwrong. For every person who threatens to sue me (and there have been a few), there are dozens who are grateful I take the time to examine and identify their samples. Many vow to keep hunting; some just give up and buy a meteorite on eBay or at the Tucson Gem and Mineral Show. My colleagues at UCLA and I don’t charge for looking at specimens to determine whether they are meteorites or not. But if a sample is a real meteorite (and we get many from meteorite dealers and collectors) then we ask for at least 20 percent of the specimen or 20 grams (whichever is the lesser amount) in return for analyzing and classifying the sample. (As our expenses have gone up, we’ve started asking for $120 per meteorite to pay for time on analytical instruments.) This is the principal way that the UCLA meteorite collection grows. Dealers who send their specimens to us set their prices through this process; UCLA acquires valuable meteorites; and collectors get to indulge their passion and pay the dealers. Where on Earth do real meteorites come from? Although meteorites fall at the same rate everywhere on the planet (and one could land on your roof next Tuesday or dent your mailbox), there are a few places where they tend to accumulate and are more readily found. Many newly acquired samples come from Antarctica where a NASA-sponsored team goes every southern summer to pick meteorites off the ice. Hordes of meteorites are stranded at the surface when the ice they are trapped in flows upward at the Transantarctic Mountains. There, the ice slowly sublimates from solid to gas, exposing the meteorites. Many other samples are found in the Sahara Desert where Bedouin tribesmen pick them off the ground. A number of meteorite collectors in Southern California spend their weekends scouring the dry lakes in the Mojave Desert; one industrious graduate student at UCLA has found more than 200 small meteorites over the years. Meteorites are easier to spot in some of these arid regions because of the scarcity of terrestrial rocks; also, in some areas, fierce winds blow away overlying dust and sand, exposing meteorites that fell long ago. Where in space do meteorites come from? 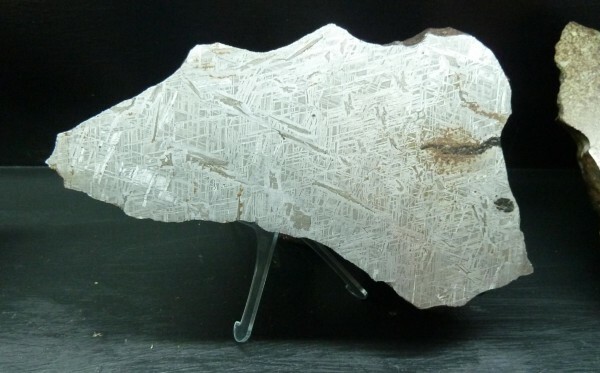 There are about 50,000 different meteorite specimens that are currently known. Because many meteorites break apart while plunging through the atmosphere, this figure probably represents about 10,000 different falls. Almost all of these meteorites come from asteroids (about 100 different ones); currently, there are 193 specimens from the moon (representing about 110 separate meteorites) and 134 specimens from Mars (representing about 80 separate meteorites). The UCLA meteorite collection includes several of these lunar and Martian samples. The collection is the fifth largest in the United States, and the largest on the West Coast. We have more than 2,800 specimens representing about 1,500 separate meteorites. The collection includes the largest known pieces of approximately 40 meteorites and the type specimens (the originally described samples) of more than 300. Eighty of the type specimens are from California. Our state actually accounts for a disproportionate amount of recovered meteorites—13 percent, even though we take up only 5 percent of the area of the continental U.S.—thanks to the meteorite treasure trove in the Mojave. About 100 of our most beautiful samples are on display in UCLA’s new Meteorite Gallery in the geology building. There is even a display of the most spectacular meteorwrongs sent in over the years. The remaining rejects get exiled to the department’s rock garden. They are the stuff that dreams are made of.